Iceland’s tourist industry is burgeoning as adventure-seeking visitors flock to the rugged Nordic nation to partake in activities such as whale watching, ice climbing and spelunking. The number of foreign visitors to Iceland surged 40 percent to 1.8 million last year – dwarfing the island’s population of 335,000. This year, Keflavík airport expects another 27 percent increase, to 2.2 million, according to estimates cited in a recent study by IMF economist Uwe Böwer. 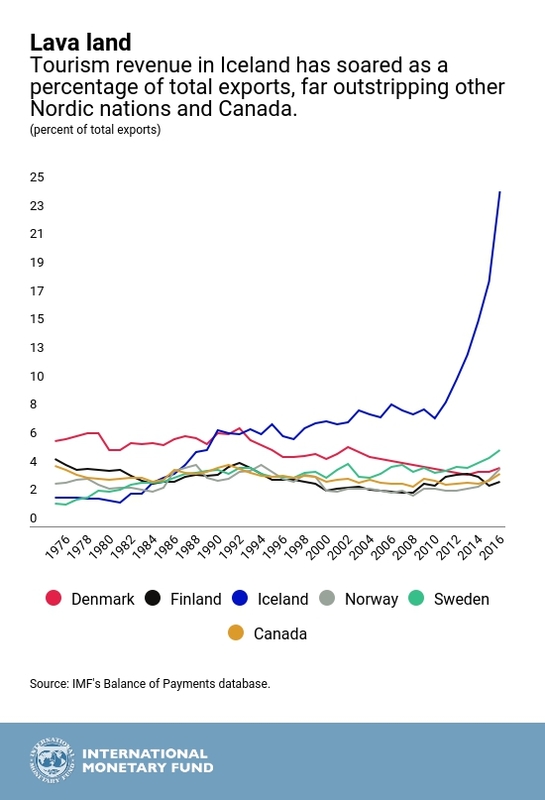 As our chart of the week shows, Iceland has raced ahead of its Nordic neighbors and Canada in travel receipts as a proportion of exports. Tourism now makes up about 25 percent of the nation’s export income. That figure rises to 39 percent when applying a wider definition that includes airline transport—exceeding fisheries, aluminum and silicon combined. Travel accounts for some 12 percent of gross domestic product. That’s a remarkable achievement for a nation once known mainly for banking crises and volcanic eruptions—in April 2010, Eyjafjallajökull spouted a cloud of ash that closed much of Europe’s airspace for six days. Can the boom last? Probably yes, though the pace of growth is likely to moderate. Tourists will continue to be drawn by Iceland’s natural wonders, well-developed tourism infrastructure, low crime rate and welcoming atmosphere. So far, visitors haven’t been deterred by an appreciation of the currency. Even if gains in the currency start to have an impact, it’s likely that a slowdown in demand will damp further appreciation, helping to keep tourism at a sustainable level.